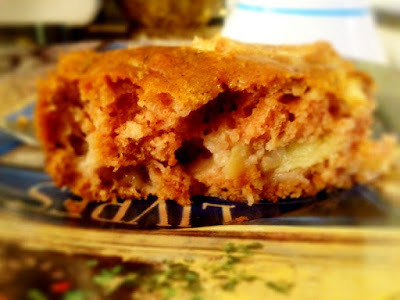 This apple cake is so moist and fluffy. It's hard to believe that its a vegan cake! This make 9 servings of cake, each serving packs about 180 calories. I used fresh apples from my Bountiful Basket. Preheat oven at 350F for 15 minutes. Grease an 8-inch square baking dish. Whip together Ener-G, water, soy milk and vanilla extract until nice and foamy. Add the Ener-G mixture to the creamed butter/sugar and beat everything together with the hand mixer until thoroughly combined. This mixture looks creamy like a white sauce. In another bowl combine the flour, baking soda, salt, cinnamon and nutmeg. Add this to the wet ingredients. The batter will be thick. Spread the batter in the prepared pan and bake for 35-45 minutes or until a toothpick inserted near the center comes out with just a few crumbs.You can tell that the cake is done when it starts pulling from the edges.